Today in Baku State University was held VI International Scientific Conference "Innovative problems of modern biology." The event was conducted by young scientists and researchers, and was dedicated to the 93-th anniversary of national leader Heydar Aliyev. Scientific Council has held its expanded meeting. Opening the event, rector, academician Abel Maharramov announced the agenda of the meeting. Main lab assistant of the department of Botany, Faculty of Biology Sabina Huseynova went to Czech Republic in august. The event titled “Baku-2015: Support for the first European Games” has been held at BSU. 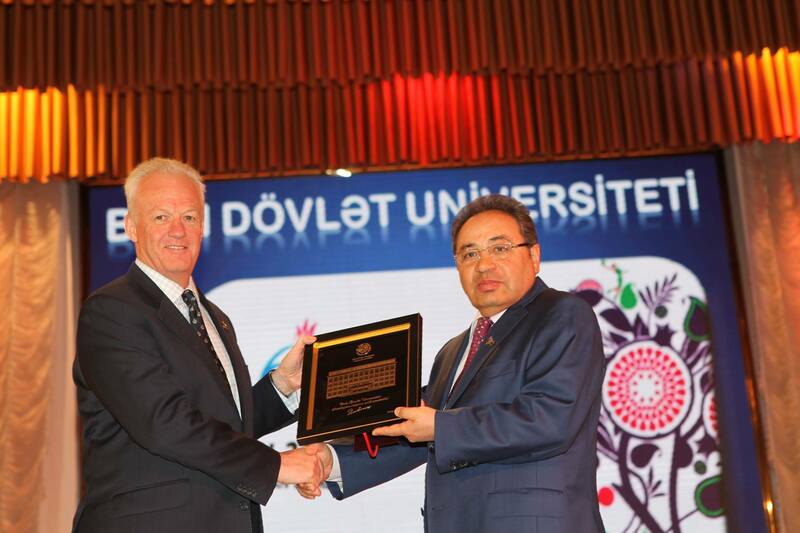 Director-General of the UN Food and Agriculture Organization (FAO) Jose Graziano da Silva was awarded a Diploma of Honorary Doctor of the Baku State University (BSU). Professor Khudaverdi Ganbarov head of Department of microbiology of Baku State University during 10 days has completed Podcast training 15-th – 26-th February 2015 in Westminster University (London city) of United King. The chief laboratory assistant dissertant of the Department of Microbiology Eynulla Musa Musayev took part in the European Biotechnology Congress which was held on May 15 — 18, 2014 in Lecce (Italy). SESREMO is a project within the framework of the TEMPUS programme*. Budget size: €1.114.000. The main aim of the project is to ensure that the targeted universities can offer two cycle programmes in space based remote sensing techniques to improve teaching in line with the new development in the area, the market demand and according to the Bologna process, last recommendations in Bucharest communiqué and best practice in order to bring the universities closer to the changing labour market and European education area. International Conference on “Innovative problems of Modern Biology” devoted to 110th birthday anniversary of outstanding scientist, Honoured Science Worker, Prof. Mirali Abdulla oglu Axundov will be held 25-26 May 2012 in Faculty of Biology, Baku State University. Age of participants must be up to 35 years old. Material must be presented to organizing committee (anar.biochemistry@gmail.com) till 10 May 2012. 17.11.2011 was passed the next seminar of the Student Society. At a seminar made a presentation on the theme "Blood and our life" associate professor of Plant Physiology department Tahirli Sevda. She gave detail information about the history of the study of blood, blood groups, also about the evolution of blood groups and the history of their formation. 10.11.2011- Was passed the seminar of SSS of the faculty of biology. At the seminar a bachelor's degree, a student of the fourth course of Elvira Ibragimova gave detailed information about the disease schizophrenia. She gave information about the history of the study of mental disorders, classification of mental diseases, their diagnosis, treatment, and about the problems standing in front of the researchers. 27.10.2011 was passed the regular meeting of the Student Scientific Society of the Faculty of Biology. At a seminar on the theme "Hybrid power gene" made student IV year Ibrahimova Elvira. She described the phenomenon of heterosis in hybrids of a lion and a tiger. One of those rare hybrids of male lion and female tiger was found in the zoo of Novosibirsk. In this hybrid, the so-called ligre, there is a strong effect of heterosis. 20.10.2011 passed the regular meeting of SSS Faculty of Biology. At a seminar on the theme "Siamese twins" made student IV year Mustafazadeh Sona. She gave detailed information about types of siamese twins, research history, the relationship between them in different countries and societies, and the reasons for the appearance of Siamese twins. Were explained to the hypothesis and theory to explain this phenomenon. October 03-08, 2011 head of the Department of Microbiology, prof.Kh.Q.Qanbarov parcipitated in an international symposium conducted in the experimental basis Russia's city Irkutstk and Lake Baikal. According to the memorandum signed between the Baku State University and the department to reduce the threat at the U.S. Embassy in Azerbaijan was organized regular training for the five biology students from BSU. Graduate Faculty of Biology, Gulzar Narimanova, Aygun Israilova and Elvin Huseynov participated in training in field of molecular genetics. 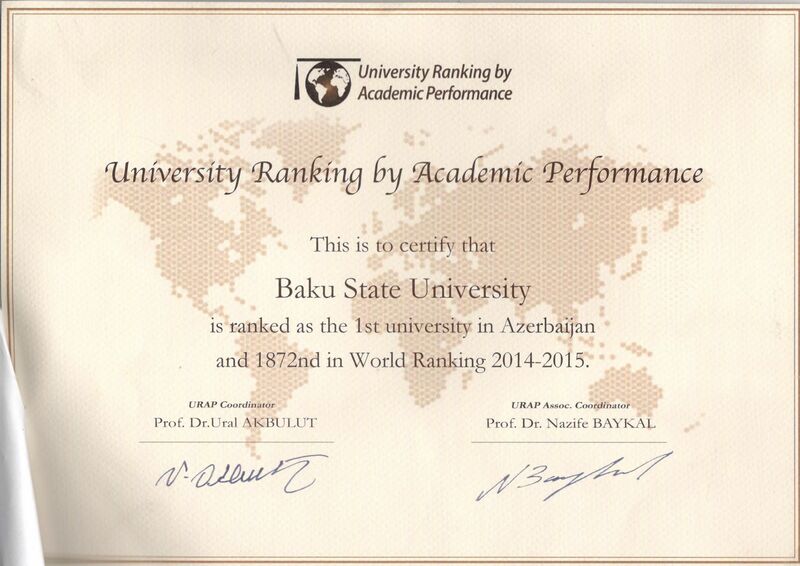 Trainings were organized with the participation of the German Academic (DAAD), Medical Faculty of Heidelberg University of Mannheim (UUM), and Baku State University.